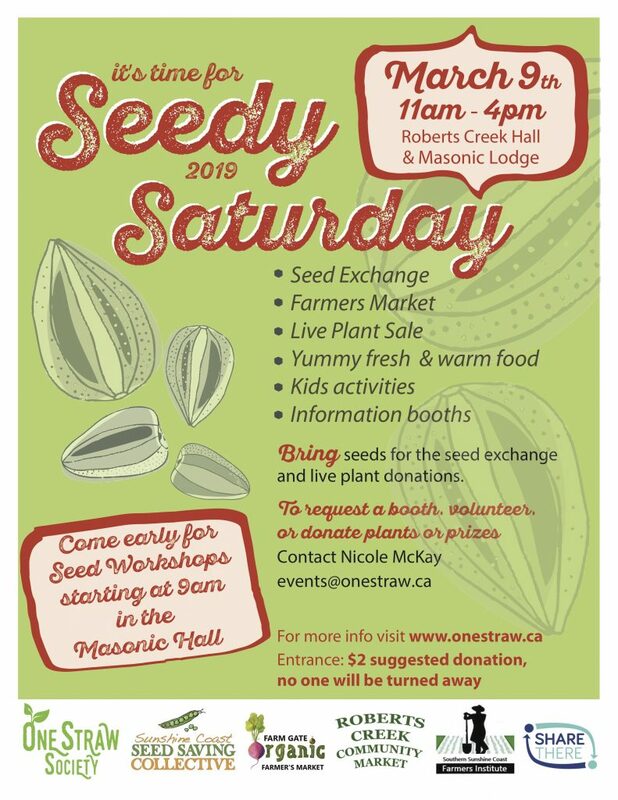 Its time for the Annual Seedy Saturday hosted by our local non-profit, One Straw Society in Partnership with The Sunshine Coast Seed Collective, Roberts Creek Farm Gate Market, Roberts Creek Community Market and the Grandmothers and Grandothers. The main event will take place from 11am – 4pm in the Roberts Creek Community Hall and The Masonic Hall with local Non- GMO seed vendors with other locally crafted value added products available for sale. We are excited to also feature a Community Seed Exchange (bring your seeds to trade! ), Live Plant Sale, Local organizations, Live music and warm healthy food available in the kitchen. Entrance fee is a recommended $2 donation with an opportunity to donate $5, $10 or $20 to be entered into great door prize draws. There is no bank machine on site, so please bring cash. There will be a line up of workshops announced soon for during the event, and we also invite you to come early for two wonderful Seed related workshops at the Masonic Hall from 9am – 11am. These workshops are being sponsored by the Sunshine Coast Seed Collective and are offered by donation. The Grandmothers and Grandothers will also have some nice treats available for sale at this time and throughout the day. The intention of this event is to create a gathering space for our community to participate in a communal seed exchange prior to planting season with local farmers’ and artisans’, freshly prepared food, treats, kids activities, information booths, workshops and speakers. This is a fun and informative event for the entire family to enjoy. All proceeds raised during this even go to support the efforts and future endeavours of One Straw Society.